To synchronize the sound with specific images in your scene, you must set a start frame for your sound. To make sure the sound ends by a certain frame, you must set an end frame. In the Sound Element panel you will see some coloured tabs, these tabs represent the frames. The frame number is shown inside the tab flag marker. These tabs indicate the start and end frames of a sound segment. 2. Select the sound sample you want from the Sound Element panel. To distinguish one sound section from another on the same sound layer, check the frame numbers that appear on tabs flanking the start and stop lines of each waveform section. Click on the Play button in the Current Sound panel (only the selected sound plays). 3. Within the Sound Element panel, click and drag the selected clip to the frame number where you want it to start playing. You can only move the clip to a section that does not already contain a clip; you cannot overlap two clips in the same element. 4. 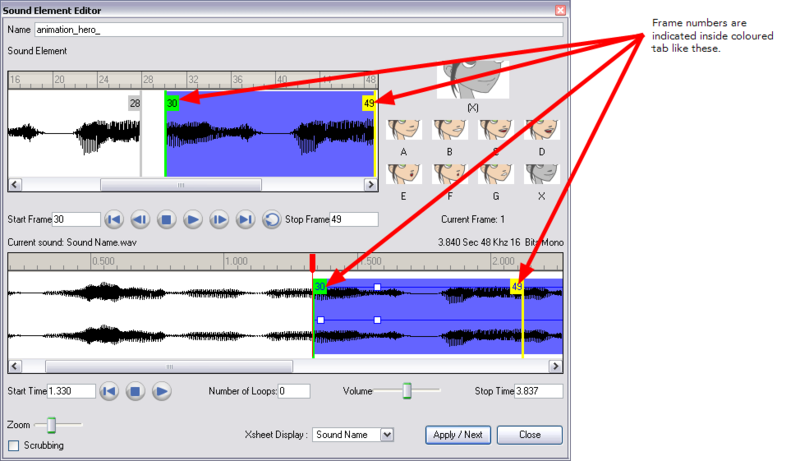 To change the end frame, drag the yellow marker at the end of the waveform to the frame position. 5. To hear how all of the clips fit together in the element, click on the Play button in the Sound Element panel. If you only want to hear the selected clip, click on the Play button in the Current Sound panel. 6. Click Apply/Next when done. 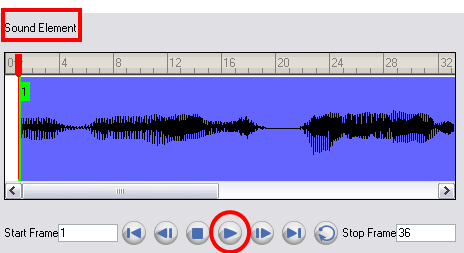 The Xsheet and Timeline views display the sound clip at the start frame you selected.